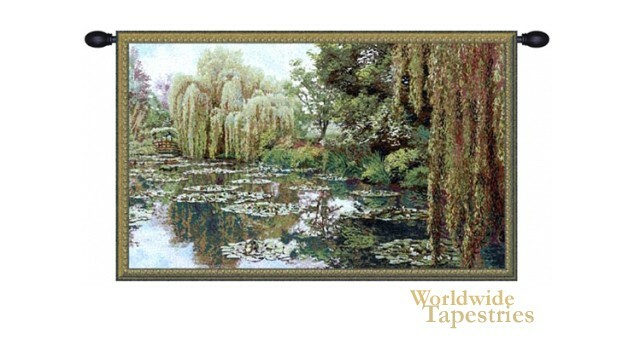 Monet Lake Giverny - Right tapestry shows the lake and trees of Claude Monet's home from 1890. From this view of the larger work, we see the ghostly grey green willow in the background, the autumn colored willow on the right, and the abundance of lily pads on the reflective surface of the lake. Monet was the most famous of the impressionists and rendered his nature subjects most brilliantly, including the gardens in his own home. This tapestry is backed with a lining and a tunnel for easy hanging. Note: tapestry rods and tassels, where pictured, are not included in the price. Dimensions: W 40" x H 23"